Drilling Waste Management(DWM) has now becoming more and more important for oil & gas drilling.GN Solids Control is a leader for drilling waste management equipments,Our products including Vertical cuttting Dryer,Hi G Dryer,Decanter centrifuges etc. Following Photoes are the drilling waste management sytem in Beijing World Largest Oil Show. Baker Huges waste management solutions reduce NPT and environmental risk by effectively processing your liquid and solid drilling waste. 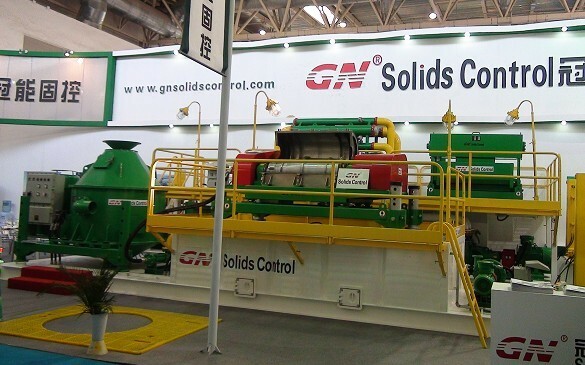 These processing solutions comprise a suite of treatment equipment that enables you to conduct your drilling operations without fear of losing valuable rig time or harming the environment.GN Solids Control have the cooperation with Baker Huges in Russian for mud cleaners,shakers and shaker screens,and are expanding for more cooperation. A major challenge in processing drilling waste is the diverse nature of the produced waste. The methods and technologies used to treat different waste streams are as varied as the waste itself. The treatment method we select for your drilling project is based on the characteristics of the waste material, the local environmental regulations, and the available infrastructure. By taking advantage of existing technology and introducing new and better equipment, we’re continuously working to reduce the quantity of spent fluids generated in drilling operations and their associated environmental risk. Our technologies focus on effective reintroduction of valuable components back into the drilling process followed by efficient handling of the residue left after the treatment is completed. Properly managing solids produced during drilling operations is critical to effectively responding to the environmental and economic pressures you face. From improved drilling fluid performance to drier solids removed from the fluid, we have the technologies and expertise to deliver high-quality performance on every project. M-I SWACO leads the industry in engineering cost-effective technologies designed to reduce the HSE footprint of your drilling operations. Our new generation drilling waste management technologies includes vacuums and pneumatic conveyance systems for the safe collection and transport of cuttings. Our wide range of cuttings treatment systems include a multi-disciplinary waste injection process and patented thermal desorption technologies. We also are the clear leader in developing drilling fluids with characteristics making them ideal for bioremediation. Fundamental to our drilling waste management strategy is not only minimizing waste, but transforming it into a beneficial resource. That strategy is at the core of the M-I SWACO culture where all employees share responsibility to protect the environment. It is the guiding force behind our company-wide program of product development, refinement and applications focused on protection and sustainability. GN Solids Control have Cooperation with Scomi Oil Oiltools for HI-G Dryers and Decanter Centrifuges.Drilling waste management (DWM) services provided by Scomi Oiltools reduces wastes generated during drilling activities to acceptable environmental levels. Our drilling waste management services are based on our Waste Management Hierarchy which governs the way we deal with solids control and waste disposal in all our drilling activities worldwide. The four levels of this basic hierarchy is reduction at source, recycling, treatment and disposal, in that order. To ensure that these steps are well implemented, precise planning for both environmental protection as well as cost-effectiveness is pivotal. This involves studies to review both the project and the disposal criteria which need to be customised for specific requirements. As part of our drilling waste management services, we also supply highly skilled staff to ensure equipments are installed correctly and that they are fully operational and well-maintained. Our employees, who trained to provide support swiftly, are on-call worldwide 24 hours a day, everyday, to be available at a moment’s notice. TOP 4 Largest:Halliburton Drilling Waste Management Services. We are not a one size fits all solids control equipment provider. To deliver totally customized waste management solutions, our equipment is designed in a modular format enabling the implementation of unique configurations that fit a wide range of operating needs. Before deploying manpower and equipment, we carefully plan the waste management solution according to local legislation, to maximize drilling efficiency, ensure sustainability, and meet or exceed safety and environmental standards. As the demands to reduce the environmental impact of operations increase globally, Baroid continues to develop purpose-built facilities designed to handle and treat the waste streams generated by operations. Custom treatment and disposal techniques are selected based on the goals of maximizing fluid recovery and reuse for operations, while minimizing actual disposal volumes. It used to be all about cost, but probably the biggest challenge facing the industry today is environmental compliance. From developing more environmentally-friendly fluids to efficient waste management, we understand how critical it is to have a minimal impact on the environments in which we work, while also providing cost-effective solutions. Weatherford has an extensive history in the manufacturing and wholesale of drilling fluid products with locations around the world. Our legacy not only includes acquisitions but organic growth as well that has brought us to a recognition as a global supplier of full-service and wholesale drilling fluids as well as drilling waste management equipment, engineering and services. We operate seventeen liquid mud plant facilities and supplied over 1.2 million bbl of oiled based mud in 2010. Currently we are providing service to over 50 rigs around the world and over 1000 wells drilled to date. Our mud and chemical offerings include aqueous to non aqueous based fluids, drill-in fluids, air and foam systems (water and oil based), a complete range of completion fluids, wellbore cleaning (mechanical and chemical) and an array of specialty products. We now offer a full range drilling waste management equipment like: solids control, shaker screens, cuttings containment and handling, recycling and recovery, waste water treatment, filtration and disposal as well as engineering services for drilling waste management designs, mud tank systems and liquid mud plant design. When things get busy we offer you top quality management services for your drilling fluids and your drilling waste management needs. Using our proprietary WEL-ONESM comprehensive database services we can provide real-time reporting so you can stay on top of your project. 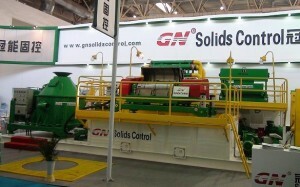 More about the drilling waste management equipment from GN Solids Control. TWMA provides integrated drilling waste management, engineering and environmental services and technologies to the global oil and gas industry. Operating both offshore and onshore, we handle and treat drill cuttings and associated oil industry wastes. TWMA is a single source provider for managing waste materials – from exploration and production, to maintenance and decommissioning. Drilling Fluids and Solids Control Management,Tervita is a leading North American environmental and energy services company. We support responsible resource development by offering highly effective, convenient and environmentally sound solutions to our customers’ production and operational waste issues to help minimize environmental impact and maximize return of recoverable and recyclable materials. Because of the nature of your project, bring your HSE and R&D colleagues and save US$900 when you register 3 staff. Hurry, offer ends 30 November 2012. Call us at +65 6818 6344 or email us at drillingfluids@arcmediaglobal.com. You can also visit us at http://www.arcmediaglobal.com/drillingfluids. I am a mechanical engineer , I have 06 years Experience in drilling activities starting from site preparation, paperwork, permit to work and including the supervision of the drilling activities and then more specialized in the Thermo mechanical Cuttings Cleaner (TCC). •	Knowledge on the principles of traditional oil instrumentation (sensor of level, flow, temperature and pressure) as well as the bodies of execution (valves). I am very excited about future opportunities in your area and would love to work with your company, particularly in the area of diesel as specialist. I would be pleased to meet you in person to discuss my background in relation to the needs of your organization. What equipment do y’all have besides the centrifuge to remove LGS? I was looking for a filter system that would remove colloidal solids in a synthetic base mud. The mud weight we are dealing with is 10.0 ppg to 11.0 ppg. I also have a mud and solids business that we go out and monitor the solids control equipment for efficiency and also run mud checks behind the mud engineers to ensure the quality of mud they are reporting is correct. We also track mud properties and disposal of the drill cuttings and look for ways to reduce the cost on mud and solids and waste. I would be interested in getting more work for my company if y’all have anyone that might be interested in this service please have them contact me. Wow, this post is nice, my younger sister is analyzing these kinds of things, so I aam going to convey her.